The small horizontal bars in the picture are size scales. Each bar represents 100 microns (one tenth of a millimeter). Globigerinoides trilobus has, as the name says, three lobes. Picture number one shows the "spiral" side, and picture number two shows the "umbilical" side. 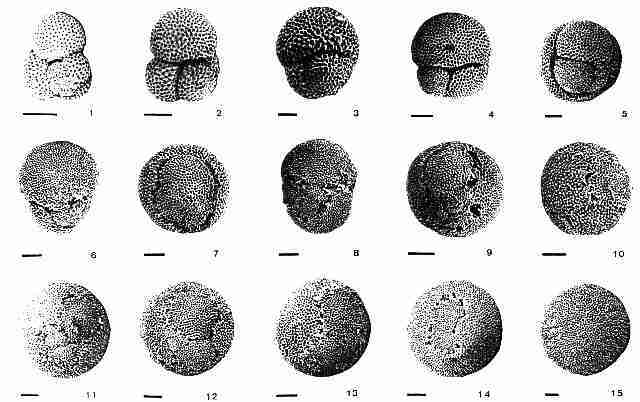 Orbulina universa is number 15, the spherical fossil. It seems featureless and boring, until you break one open, and discover a three-lobed inner shell. In fact, the sphere surrounds what is essentially a Globigerinoides. The sphere is grown by an amazing and complicated process. A bulge emerges through the main aperture of the inner shell, and forms a huge number of rhizopodia. They collectively grow a membrane on their tips, and the outer shell is then secreted onto that membrane. The high price of this process may explain why Orbulina is today less numerous than Globigerinoides. It is not known if forams obtain any advantage from being spherical. Number 3 is G. bisphericus: numbers 4, 5 and 6 are Praeorbulina sicana. When these existed, there were also intermediates between them and G. trilobus, so all three were variants of a single species. Numbers 7 through 14 are transitional, and are shown in time order. The differences are mainly in the apertures, and in the size ratio of the inner and outer shells.